In social work, we react to problems by treating them. Treatment has, in many ways, become the focus of much social work. Clinicians and researchers often try to determine how best to address present and past issues. They look at what is and don't look often enough at what will be. "In general, that's a challenge in the United States," says Jordan DeVylder, PhD, an assistant professor at the University of Maryland School of Social Work. "It is a part of our culture, of how we view health. We are very focused on the idea that you have an issue and then you treat it." However, that idea leaves out a crucial aspect of social work: prevention. Preventive care can promote physical, mental, and behavioral health. It can save lives and money, but for that to happen, it must first be more prominent part of social workers' training. "We have to train the workforce to be involved in prevention," says J. David Hawkins, PhD, an endowed professor of prevention at the University of Washington School of Social Work. "We train people to intervene where kids are already enmeshed in problems. That's important. But we also have to provide preventive interventions." In an attempt to do that and to better highlight the evidence supporting preventive action, "ensuring the healthy development of all youth" has been identified as one of the American Academy of Social Work & Social Welfare's Grand Challenges for Social Work. The Coalition for the Promotion of Behavioral Health has deemed "unleashing the power of prevention" as having the greatest potential to achieve the grand challenge. "The Grand Challenges for Social Work Initiative is intended to increase the impact of social work by strengthening the underlying science behind what we do and, in so doing, to make broad and deep measurable changes in society over the next decade. To do so, we will take advantage of the fundamental truth of social work that social relationships and social organizations are among the most influential forces in human experience," explains Richard Barth, PhD, MSW, dean of the University of Maryland School of Social Work and president of the American Academy of Social Work and Social Welfare (AASWSW). Sarah Butts, MSW, assistant to the president at AASWSW, further explains that the grand challenges model is based on those from other fields, such as engineering. For social work, "The 12 grand challenges and supporting papers emerged from input from the field," says Butts, who staffs the grand challenges initiative and coordinates the work nationally. "To develop the grand challenges, the AASWSW solicited ideas, including two calls for concept papers and additional outreach to fill gaps. The most promising concepts were selected, papers were further developed, and a list of 12 grand challenges emerged," she says. The goal of ensuring healthy development for all youth emerged. The key to that challenge? Prevention. "What's really exciting in the area of youth development is the progress that's been made in our ability to actually prevent behavioral health problems," Hawkins says. "We've learned that there are common risk and protective factors that can predict [behavioral health problems]. And we've also learned that you can change those things and actually prevent behavioral health problems from developing." Prevention can begin as early as gestation. "[Prevention services] can start during the second trimester of pregnancy," Hawkins says. "There are programs like Nurse-Family Partnership that start when [for example] a pregnant teenage girl who doesn't have a partner or other supports is visited at home by a nurse. Preventive interventions across development through adolescence have been tested and found effective. They work." DeVylder is currently taking part in research that examines whether schizophrenia and other psychotic disorders can be prevented. "There is a lot of work being done in hospitals and university-based specialty clinics," DeVylder says. "We work with a very small group of individuals who are adolescents or young adults and are experiencing hallucinations and delusions, though not to the same level of intensity [as an adult with a diagnosis of a psychotic disorder]. These youth are help seeking and, based on the criteria, they're identified as being at high risk for progression to a psychotic disorder. "It does seem possible to actually prevent the initial onset [of the disorder], based on the evidence we have so far. Psychotherapy, maintaining family supports, maintaining social supports, staying in school, staying in work, maintaining housing, and harm reduction to substance use are a lot of the things that are working for this group," he says. While the work DeVylder is a part of is still in the early stages of development, Hawkins notes that there are more than 60 evidence-based interventions on Blueprints for Healthy Youth Development, a site aimed at providing a registry of tested and effective programs to be used with families, in schools, and in communities, and these programs are ready to be implemented. What's more, they work and they save lives and money—music to every social worker's ears. "One of our strong arguments is that preventive interventions not only work but they're [also] more cost-effective," says Jeff Jenson, PhD, the Philip D. and Eleanor G. Winn professor for children and youth at risk at the University of Denver. Together, Jenson and Hawkins were a part of the team that authored "Unleashing the Power of Prevention." Jenson and Hawkins note that mental and behavioral health problems cost the United States approximately $247 billion per year. "If we could reduce those problems by even 20%, as we believe is possible, think of the savings to society," Hawkins says. "The majority of people in the United States don't realize that prevention is effective. They are not aware of the large number of tested and effective programs that exist for children and families," Jenson says. "We think it's important to shift the paradigm in a way that acknowledges the importance of prevention in our society. Along with that, we think it is key that we fund more programs that offer preventive interventions for young people and families." But why should social workers lead the way in prevention? Why should they shift the paradigm? "Social workers are trained in fundamental ways to assess problems, assess clients, assess a variety of situations," Jenson says. 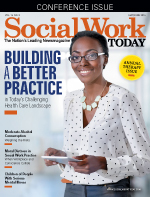 "Social workers have a presence in so many different ways and are very well positioned to contribute more to prevention practice. "If we think back to the roots of social work, in the early days," Jenson continues, "it was all about building relationships, understanding community needs—trying to prevent these problems." In order to do that, social workers need to get involved in the push for prevention. "One way to get involved is to join our coalition," says Jenson, referencing The Coalition for the Promotion of Behavioral Health, which was created to further the prevention work of the grand challenge and comprises social workers and allied colleagues throughout the country. "Our coalition includes task forces that have been established to raise awareness about the effectiveness of prevention, assist states and communities who are interested in increasing preventive interventions, and train students to become skilled in prevention practice and policy," Jenson says. Involvement in the coalition can and will lead to a sharing of ideas and practices surrounding prevention. "One of the things that I'm hoping is that faculty in schools of social work and other disciplines will offer courses on prevention," Hawkins says. "Kim Bender [an associate professor at the University of Denver] and Valerie Shapiro [an assistant professor at the University of California, Berkeley] are collecting curricula that people are using. If someone wanted to teach a course on prevention, he/she could get in touch with them. They can get you curricula to help you get started. "If you're integrating something on prevention into a course now," he adds, "share that with us." For those in the field, Hawkins encourages the use of Blueprints for Healthy Youth Development initiative at the University of Colorado Boulder. "Look at the programs that are on the Blueprints website," he says. "Ask, 'Which of those can I add to my bag of tricks?' If we're successful, it's going to be really important that people have the skills to be able to lead prevention work. Be prepared to do preventive interventions in your community and get the word out about these programs and their effectiveness. "We have to create demand on the part of the public to say we want to prevent these problems," Hawkins continues. "We don't want to wait until kids get kicked out of schools. We need to have preventive interventions that are effective." We have to, as Hawkins and Jenson denote in the title of their paper, unleash the power of prevention. For more information on the American Academy of Social Work and Social Welfare and the 12 Grand Challenges for Social Work, visit grandchallengesforsocialwork.org. For more information on evidence-based preventive models/programs, visit www.blueprintsprograms.com.